Are you trying to lose weight with little or no success? Like most people, losing weight can be a lifelong battle with no end in sight. With obesity at alarmingly high rates these days, a whole new crop of weight loss aids are popping up all over the place. Tablets, powders, capsules and potions are just among a few of the weight loss supplements that you can find in stores or order online. SlimStrips offers a unique way to lose weight, but does its uniqueness actually work? SlimStrips are adhesive strips, similar to a band-aid, that contain a proprietary blend of natural herbs, botanicals and plants including Yerba Mate, spirulina, passion flower and chamomile that are supposed to suppress your appetite when absorbed into the skin. You apply the strip onto a clean and dry spot on your body once a day and, according to the manufacturer, you will experience a reduced appetite which means you will eat less and lose weight in the process. The strip releases these effective natural ingredients into your body as opposed to taking a pill or any other digestible weight loss product. One box of SlimStrips contains thirty strips—a month’s supply. The cost is $64.15 / £39.00. There is also a two-month supply option that costs $107.83 / £65.00. It is recommended that you apply the strip in the morning and on your wrist, thigh or arm where there is little to no hair as that can affect the absorption of the strip’s ingredients. The product is made by a company in Ireland, but is sold through their website. The idea of applying a strip to your skin each day is as easy as it gets. And with all natural ingredients, it is safe to say that you will not have to worry much about any serious adverse effects. 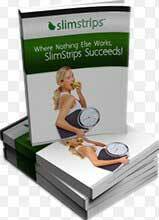 The product’s website also features several free electronic books and PDF files that you can download that will help you with your health and fitness goals as well as how SlimStrips works. This is very helpful to sustain long lasting weight loss. Unfortunately, even with natural ingredients and an easy application process, there is still a lot wrong with this product. First off, the product’s website does not have a full listing of the strips ingredients. It is only mentioned as a proprietary blend of herbs and botanicals, but there are no specifics as to what they are. On top of that, there are no clinical studies, research or any scientific proof that the product actually works. All the site offers are a few random quotes from people who claim they used SlimStrips and lost weight—hardly concrete proof of its success. 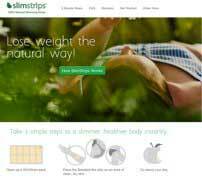 SlimStrips is also on the pricey side costing more than two dollars a day for a one-month supply. Most weight loss supplements cost significantly less than this and have a lot more in the way of useful information and research. What is highly noticeable when you navigate the SlimStrips website is that they answer many questions regarding the product, but they are often general in nature. For example, on their FAQ page, one of the questions is “What is the disadvantage to SlimStrips?” The reply is simply “You are going to have to buy a new wardrobe to fit your new figure.” Several other questions offer a coy and almost cutesy-type response. Another question related to exercise while using SlimStrips offers a generic response stating that exercise is always a good idea and the reason many people do not do it is because they are overweight and lack energy. As you can see, there is a certain disconnect between the use of SlimStrips and losing weight and exercising. It almost seems like the product is obsolete if you follow a healthy diet and exercise. Using SlimStrips does not seem like it will cause any harm, but it also seems like it is completely useless if weight loss is your goal. It would be helpful for potential customers to know just exactly how (and if) the ingredients in the strip work once they are absorbed into the skin. That alone is the whole purpose of the product. As it is, none of the ingredients possess any type of appetite suppressing effect which is another problem since that is what the product claims to do. With the lack of any real proof that this product works, you would be better off with one that has studies and science to back it up as an effective weight loss tool—and for a lot less money. The official website is the most obvious. Slimming patches although they appear to deliver similar ingredients do not compare to supplement form diet aids in the form of capsules. The capsule that we recommend is Garcinia Cambogia. 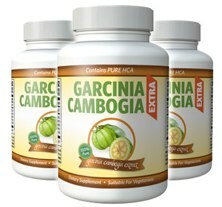 Garcinia Extra is a premium strength brand that also contains Raspberry Ketone.